Bee Venom Therapy Is Working For My Mom- So Far, So Good. I'm happy to report that in under 2 months of consistent Bee Venom Therapy (BVT), my Mother is completely off her meds (2 weeks now) & doing really, really well. She is working her arse off for it! 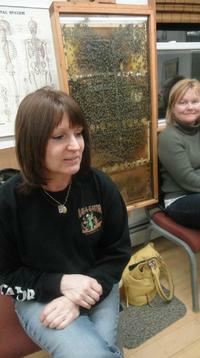 She's stinging 20-25 stings 3 times a week, taking bee propolis, raw honey, bee pollen & royal jelly daily. This regiment is NO JOKE! What a commitment on her part, I'm so proud of her. It hasn't all been a bed of roses though. She broke out in hives head to toe on sting number 10. We decreased to 8 stings the next session and then started climbing again with no recurrence of the hives (thank God). The stings leave tiny scars here and there which she hates, and of course, it is painful sometimes- but it's a small price to pay to have use of her hands without medicines that will no doubt kill her. She wakes the day after her sessions feeling terrific! It's a miracle. This lovely lady pictured above has severe and debilitating arthritis- she's been on meds for years that are SO extreme! She's gone for infusions (quarterly IV drip), she's given herself injections in the stomach, she's taken every kind of RA drug. One of the meds has a side effect of liver cancer!!! Whoever invented that drug ought to be shot! And now we're doing what may sound REALLY severe, Bee Venom Therapy- plus all the good and healing substances from the hive. For her it was the last option. And though it seems extreme, drastic times warrant drastic measures. She is medication free for the first time in nearly 10 years and on her way to being free of this terrible disease.